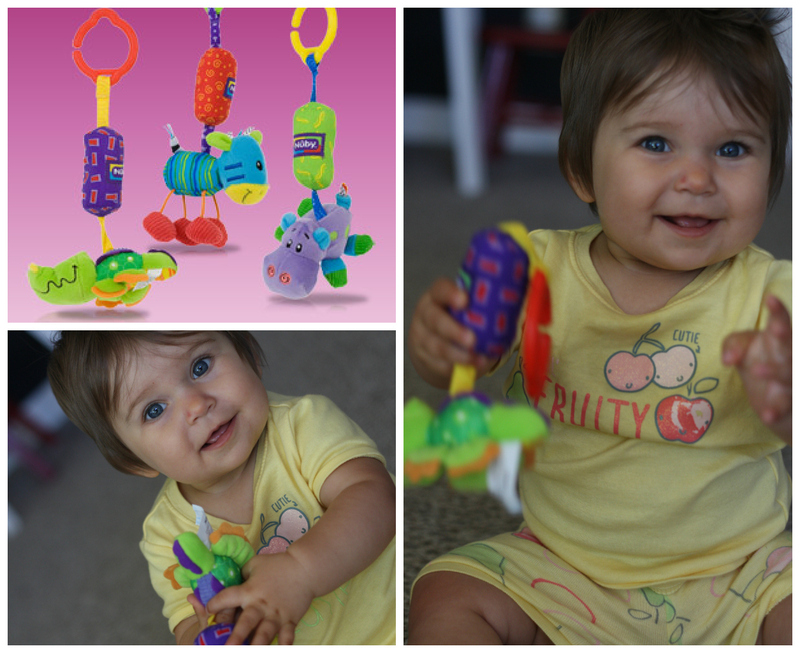 In my opinion, one of the things Nuby is really great at is their toys for babies. 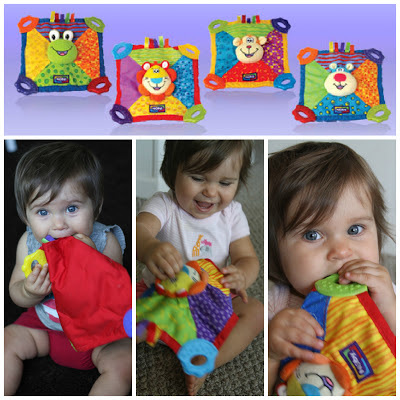 Not only are they fun, colorful and super affordable, but babies really like them! At least mine does. Now lets take a walk down memory lane. Waaayyyy back. Okay, it just seems like a long time ago. Really it was just a few months ago that this toddler of mine was a little baby who just laid there and played with her little Nuby baby toys. The teething blankie really is more of a toy than a teether to me. Sure Isla put it in her mouth. She put it in her mouth a lot. But she seemed more interested in eating the ribbon pieces on it than chewing on the hard teething corners. She has always seemed to enjoy the gel filled or silicone teethers to the harder ones. Anyway, I think her favorite part of the blankie is that it crinkles and makes lots of noise. And this just proves how easily entertained Isla is! You can purchase the teething blankie at BuyBabyDirect and Walmart. 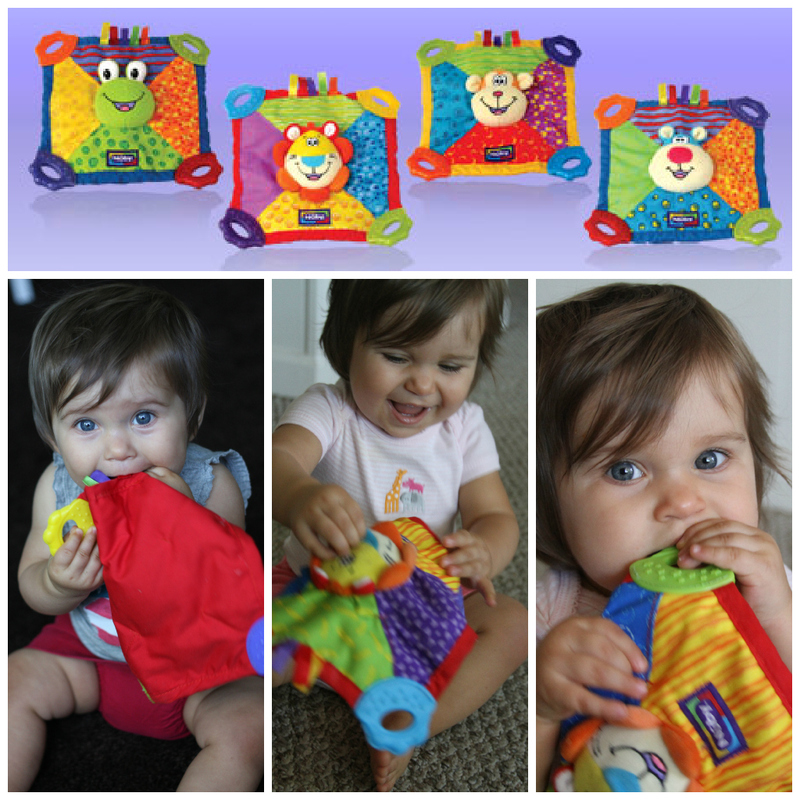 The safari chimes has one of my favorite features in an infant toy; a built in hook. I am one of those moms, the ones that likes having their kids toys hooked on so they aren't dropped...or more realistically, thrown. This feature in and of itself makes this one of my more favored toys. I like that it can be clipped to the car seat or stroller and just be there for when we need it. No having to worry about finding a toy to entertain with. Add on top of that the fact that it makes a noise when it moves and that it is the perfect size to chomp on, makes it a winning combinations. The Nuby safari chimes come in three different characters. You can purchase it at Ideal Baby for $4.99. Want to see what I had to say about some of Nuby's other infant toys? My son loves the Teething Blankie! We brought it everywhere with us for months! Oh, that teething blanket would have been great for my daughter. Your daughter is so precious! Thanks for sharing this review. Oh would have loved this when mine were teething. Your daughter is adorable!! Yeah - great product and awesome photos!